where b(k) is the binary representation of the integer k.
Note is a regular graph of degree wt(f), where wt denotes the Hamming weight of f when regarded as a vector of values (of length ). Recall that, given a graph and its adjacency matrix A, the spectrum Spec( ) is the multi-set of eigenvalues of A.
d, if u, v are nonadjacent. It turns out tht f is bent iff is strongly regular and e = d (see  and ). The following Sage computations illustrate these and other theorems in , , , . Consider the Boolean function given by . 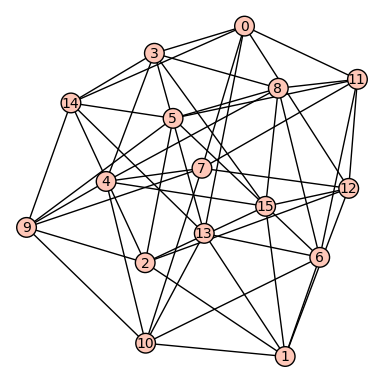 This implies the graph is strongly regular with d=e=2. Here is another example: given by . This implies that the graph is not strongly regular, therefore f is not bent. Pantelimon Stanica, Graph eigenvalues and Walsh spectrum of Boolean functions, INTEGERS 7(2) (2007), #A32. Anna Bernasconi, Mathematical techniques for the analysis of Boolean functions, Ph. D. dissertation TD-2/98, Universit di Pisa-Udine, 1998. Anna Bernasconi and Bruno Codenotti, Spectral Analysis of Boolean Functions as a Graph Eigenvalue Problem, IEEE TRANSACTIONS ON COMPUTERS, VOL. 48, NO. 3, MARCH 1999. A. Bernasconi, B. Codenotti, J.M. VanderKam. A Characterization of Bent Functions in terms of Strongly Regular Graphs, IEEE Transactions on Computers, 50:9 (2001), 984-985. Michel Mitton, Minimal polynomial of Cayley graph adjacency matrix for Boolean functions, preprint, 2007. ——, On the Walsh-Fourier analysis of Boolean functions, preprint, 2006. 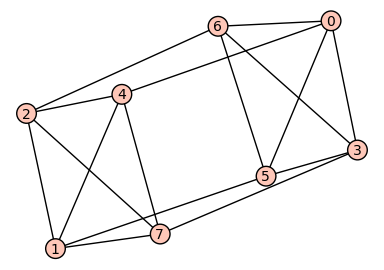 This entry was posted in math, sage and tagged adjacency matrix, boolean function, Boolean functions, cayley graph, graph theory, regular graph. Bookmark the permalink.